Jose Frappa spent his childhood in the town of St-Etienne, about 20 miles southwest of Lyon, France. 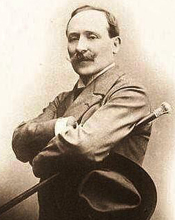 Born on April 18, 1854 to Rose and Jean-Claude Frappa, he grew up during the relatively stable Second Empire period when France was perceived as both a political and cultural leader in Europe. The family grocery store was apparently at the center of daily life in St. Etienne, and Frappa seems to be fondly remembered there even now. The young Frappa showed an interest—and talent—in the visual arts from the time he was quite young. Building on this interest, his parents apprenticed him as a designer in silk trade in Lyon; the city was not only the center of France’s silk production, but the source for the majority of the silk produced in Europe in the nineteenth century. Frappa must have learned basic design skills in this environment, but he soon determined that his interest was primarily in the art of painting rather than textile design. His parents were less than enthusiastic about this development, but eventually agreed that he should attend the Ecole des Beaux-Arts in Lyon. Frappa enrolled at the art school in 1872 when he was eighteen years old, the year after France’s resounding defeat at the hands of the Prussian army. Fortunately for the city of Lyon, the Prussian advance on Paris and Versailles was sufficient to end the war before hostilities spread further south. Despite the gravity of France’s occupation by Prussian forces, Lyon remained a thriving industrial center in the late nineteenth century; more significant for Frappa, it offered him an exciting introduction to metropolitan life. Within a year, Frappa had decided that he could make a career as a painter and moved to Paris to study at the national Ecole des Beaux-Arts there. According to an 1890 source, Frappa studied first with Isadore Pils (1813-1875), and then with Charles Comte (1823-1895) and Jehan-Georges Vibert (1840-1902) after Pils’ death in 1875. [i] Both Comte and Vibert specialized in anecdotal genre paintings which were very popular during the early years of the Third Republic. Frappa’s painting, The Flautist, which is securely dated to 1875 reflects the influence of his professors in this genre. It not only demonstrates the young artist’s competence in drawing and composition, but also provides a glimpse of the type of subject that will come to characterize much of his work. The painting is clearly an image of a model posing as a flautist in a staged setting, which may even have been intended as a reference to Mozart’s opera, The Magic Flute. It is light-hearted and just intriguing enough to draw the viewer into imagining a narrative to fit the scene. Frappa will continue to refine this approach over the years as he explored a variety of anecdotal genre subjects ranging from scenes of monks and cardinals of the Catholic church to rococo-revival lovers’ trysts. When Frappa made his Salon debut in 1876, anecdotal genre painting was amply displayed and widely appreciated by the public. According to Emile Zola’s review of the Salon that year, viewers stood in line to see The Flower Market by Marie-François Firmin-Girard (1838-1921), a charming depiction of beautiful women among the flower sellers next to the Seine. More influential for Frappa, however, was The Cardinal’s Antechamber, a painting by Vibert in which a red-robed cardinal addresses a lovely young woman seated in an opulent setting. Vibert was well known for this type of image, and undoubtedly mentored Frappa as he began to define his own artistic path. Four years later, he won an honorable mention at the 1880 Salon, no small achievement among a field of 7,289 entries, the largest number ever at the Paris Salon. In his personal life, Frappa was also thriving. He married Madeleine Marie Augustine Frézet in 1881 and set up housekeeping with her in the 17th arrondissement on the northwest side of Paris. On April 3, 1881, their only son, Jean José Frappa was born. It was during these years that Frappa seems to have begun to develop his reputation as a portrait painter. The earliest securely dated portrait is from 1884 and shows a beautiful young woman in a sumptuously lace-trimmed gown. Known only as Portrait d’élégante, she was clearly a woman of style and presumably wealth. With a new family to support, Frappa undoubtedly realized that portrait painting could provide a reliable income if he was successful at it. During the 1880s, he also began exhibiting his work in both London and the United States, expanding the market for his paintings beyond the borders of France. He held an exhibition in London in June 1887 and appears to have continued this practice well into the 1890s. Frappa was particularly active in the American art market, with representation through galleries in New York City. Although his work was probably quite widely appreciated in the United States, it is securely documented in the collection of William H. Shaw and in the catalogue of the Mark Hopkins Institute of Art in San Francisco. [ii] By 1888, Frappa was sufficiently affluent to move his family into new quarters at 12, rue de Pergolèse in the decidedly fashionable 16th arrondissement near the Bois de Boulogne. Frappa’s prosperity depended in part on his ability to work in a variety of genres ranging from the amusing anecdotal scenes of religious figures, particularly cardinals and monks engaged in all too human foibles of enjoying a glass of wine or playing popular card games, to traditional portraiture to the occasional naturalistic depiction of more serious subjects. One such naturalistic painting is a large canvas, The Wet Nurse Agency, which depicts the unusual subject of mothers interviewing wet nurses for their newborn babies. This practice was widely encouraged in late nineteenth century France as part of a national campaign to ensure infant health and safety; perhaps Frappa was commissioned by one of the health-related government agencies to create this painting. What is clear in this canvas, however, is that Frappa was influenced by the Realist painters among his contemporaries in both England and France, especially the narrative works of Ford Madox Brown (1821-1893). Public acclaim for Frappa’s work increased considerably in the late 1880s and 1890s. He was twice a member of the Conseil des 90 de la Société des Artistes Français, a private council that today might be called an executive committee; and an associate member of the newly created Société Nationale des Beaux-Arts led by Pierre Puvis de Chavannes. In 1890, he began exhibiting at the Salon du Champ de Mars that was associated with the Société. During this decade, Frappa was also exploring the world of publishing, both as an illustrator and as an author. His illustration entitled Fleur et Papillon was included in the limited edition publication of Chansons et Poesies de Camille Roy in 1898; and simultaneously, he was working on a book of his own on the subject of expression in the human face. Published by the Librairie générale des art décoratifs in 1902, Frappa’s book, Les expressions de la physionomie humaine, became a seminal book for analyzing how human beings could (or could not) control their facial expressions. This type of scientific inquiry was typical of the post-Darwinian world in which both artists and scientists sought to understand how humans fit into the scheme of biological development. 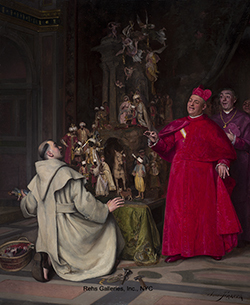 In 1897, Frappa was represented in the Exposition Internationale in Brussels with two paintings, Le dispensaire d’enfants (The Children’s Clinic) and La femme au manteau bleu (The Woman in the Blue Cloak). [iii] Although this world fair is remembered today for its introduction of art nouveau design as well as the colonial display of work from what was then the Belgian Congo, Frappa must have been actively involved in promoting the French arts section; he was awarded the Legion of Honor medal on February 4, 1898 in large part because of his work on the exposition. After such a remarkable career, beginning in the family grocery story in St. Etienne and ultimately becoming a respected and successful painter in Paris, Frappa’s life ended rather early at age 50 in 1904. He did not live to see his son become a well-known author, playwright and editor of Le Monde Illustré. Frappa is buried not far from his home in the Boulogne-Billancourt cemetery. In his hometown of St. Etienne, he was honored with a large monument in front of the town hall. Sculpted by Georges Bareau, the dedication ceremony on Mary 17, 1912 was attended by the national minister of fine arts as well as the mayor of St. Etienne and of course, Frappa’s widow, son and mother. [i] Private Collection of Mr. William H. Shaw, Auction catalogue, March 7, 1890 at American Art Galleries (New York 1890) 75. [ii] See Private Collection of Mr. William H. Shaw, Auction catalogue, March 7, 1890 at American Art Galleries (New York 1890); and Catalogue of the Mark Hopkins Institute of Art (San Francisco Art Association, 1902). [iii] See Catalogue illustré de l'Exposition internationale de Bruxelles. Beaux-arts. (Paris: E. Bernard & Cie, 1897), 3, 41.